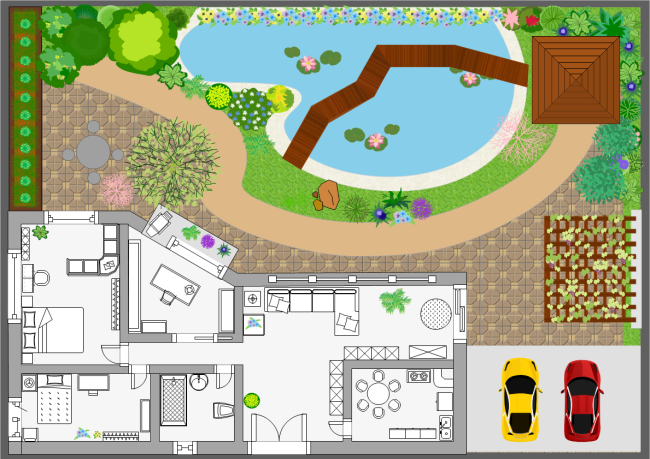 Edraw is an efficient all-in-one garden plan software for Linux, which not only allows you to plan your garden easily but also lets you save and share with others conveniently. Regardless of whether you are a green hand to garden planning or an experienced garden designer, Edraw allows you to create your own garden designs with elegant ease. 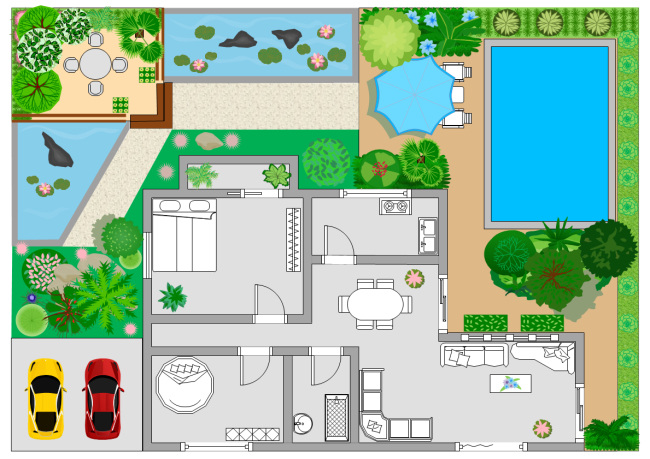 In addition to gardens, you can also use it to design home plans, office layouts, seating plans, electrical plans, etc. 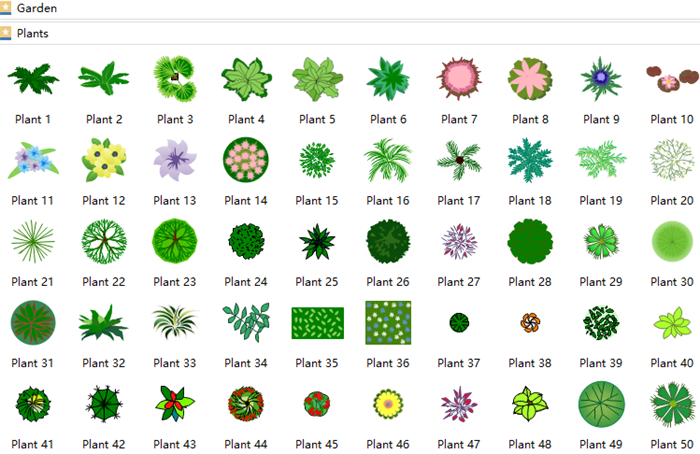 It is one of the best garden design software for Linux, you are gonna love it once downloaded it. Below are part of features of Linux garden design software that preferred by most users. Welcome to download and experience more. 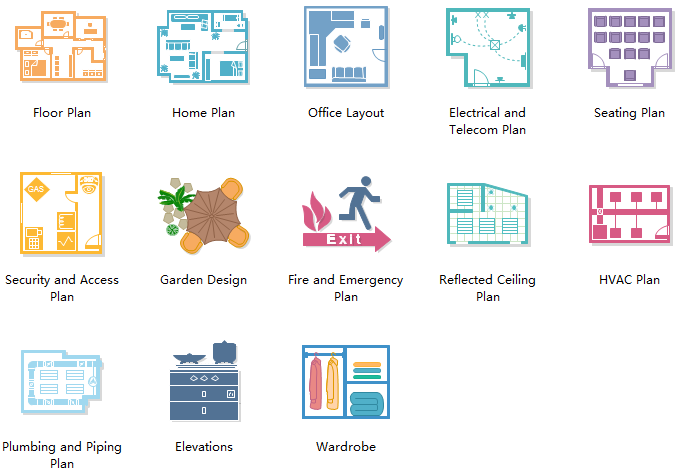 Edraw is an all-inclusive software that it can create garden plans, floor plans, home plans, seating plans, reflected ceiling plans, HAVC plans and so on. 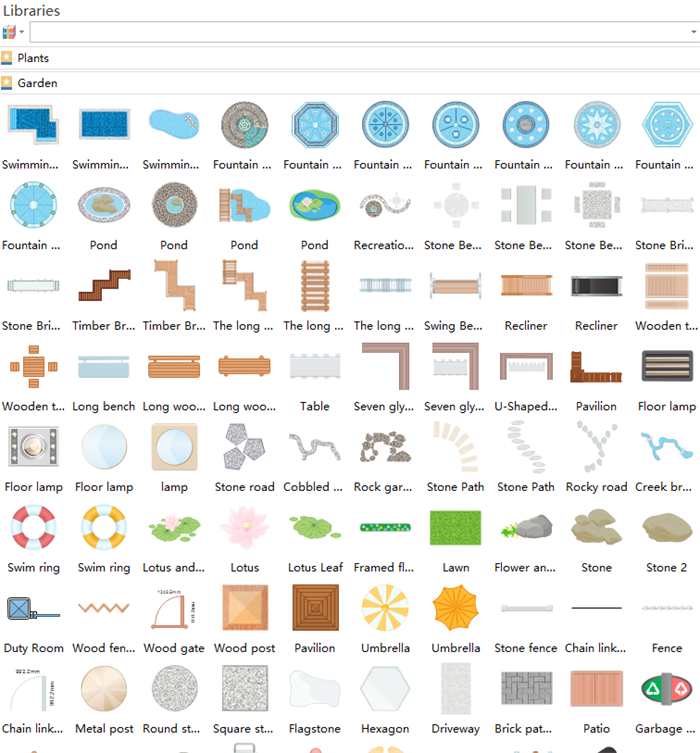 A large quantity of standard garden design symbols are provided and grouped into different categories for users to drag, drop and edit. Professionally-designed templates are offered for novice to get started quickly; experienced designers can also start from scratch by opening a blank drawing page. 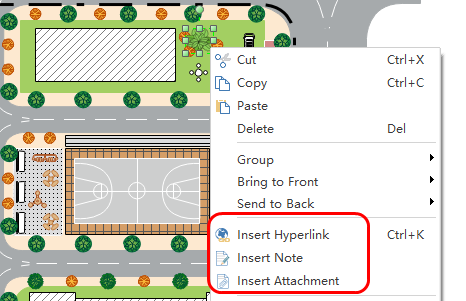 Inserting hyperlinks, images, notes and attachments is supported which makes design more impressive and enables users to have a better experience. Edraw supports exporting the file to common file formats for sharing conveniently, such as PNG, SVG, Word, Excel, PPT, PDF, Visio, etc. Edraw provides thousands of royalty free vector symbols for users to drag, drop and edit as they wish. All the symbols are classified into different categories for easy finding. And people do not need to worry about if they are not satisfied with built-in symbols since it has already prepared a set of drawing tools for users who want to create their own symbols. 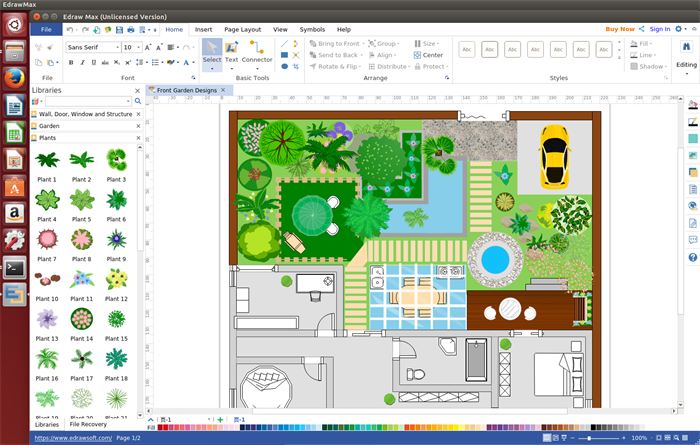 Our garden design software for Linux is such a humanized program that it has almost made everything ready and users just need to finish below steps with several clicks. 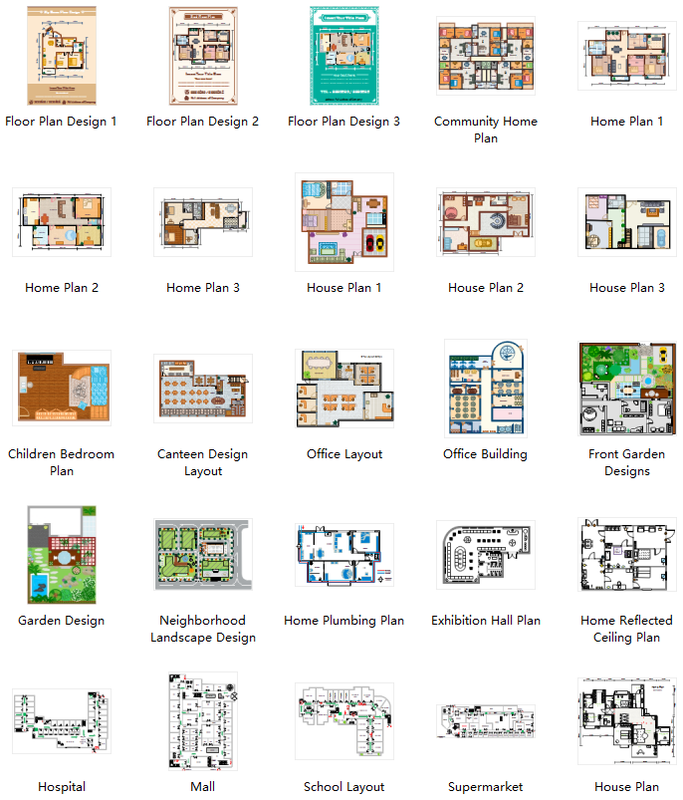 First of all, start the software, go to File menu > New, then click Floor Plan and double click Garden Design to open a new drawing page. Secondly, go to Floor Plan menu and set the drawing scale in the first option button on the basis of your own needs. Thirdly, drag proper symbols from left libraries and drop on the drawing page. Just edit, mirror, rotate, move and expand/shrink them if necessary. Fourthly, go to Page Layout and change the current theme from built-in themes if you do not like it. 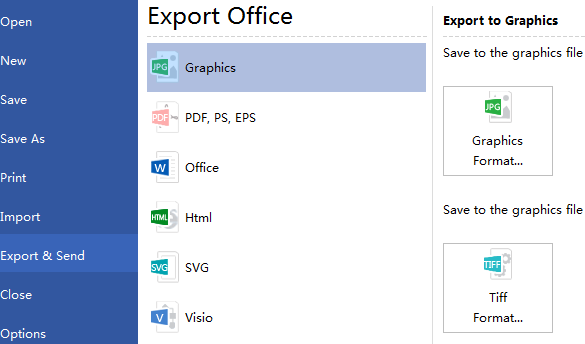 Lastly, click Save on File tab to save the design as default format .eddx, or hit Export & Send to export it to some common formats for sharing more conveniently. Gather some pictures for inspiration and make a list of needs & wants. Do a very rough sketch of the yard where you want to place things. Study the sun and wind patterns if you want to place a patio in your yard. Pick the right tools for the job which makes the garden chores more pleasant. Choose the right plants for your soil and water them mindfully. Try to be patient sine garden designing is a process which can not be finished in one day. Here listed three typical garden design example in different style. All of them are free to download, edit and share. If any one interests you, just download and edit it to fit your own needs. 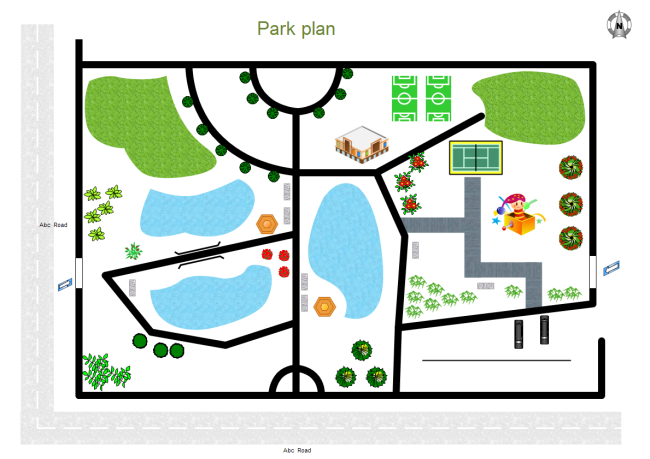 Click garden design templates to view more examples. There is no doubt that the first garden is one of the dreaming garden of most people. It is so big and has necessary plants, lakes, pool, garage and so on. This park is pretty simple with limited plants. But it has three lakes for people to enjoy the scenery. The third design is more romantic than above designs. The wooden bridge is an appealing design which makes people be absorbed in this romantic scene.